Yesterday evening at approximately 8:30 p.m., Carnival Breeze was alerted by the United States Coast Guard (USCG) that two adults on a sailboat were in need of urgent medical care. Carnival Breeze deviated course and proceeded to the location of the sailboat, roughly 24 miles southeast of Miami, and brought the individuals on board where they were evaluated by the ship’s physician. 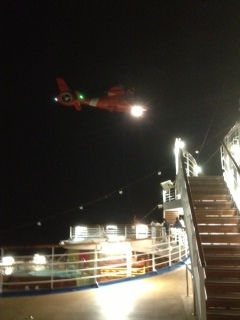 Although the original plan was to transfer the two individuals to a USCG cutter, strong currents and large swells prevented a safe transfer so one of the guests whose condition was considered more serious was airlifted via a USCG helicopter last night and the other remained on board until Carnival Breeze reached Key West, its first scheduled port of call, this morning. Both individuals were taken to shoreside medical facilities. Carnival Breeze will remain in Key West until 5 p.m. today and then continue on its current six-day cruise which departed yesterday from Miami. Carnival Breeze operates six- and eight-day Caribbean cruises from Miami year-round.